We can confirm that Matt Smith will be part of the relay team carrying the iconic Olympic Torch during its journey from the Temple of Hera to London’s Olympic Stadium. Matt has been given the honour of being named the lead runner for Saturday, 26 May. This means he is the first to carry the Torch on that day and will convey the Olympic Flame through part of Cardiff, close to BBC Wales’ Roath Lock Studios – the home of Doctor Who. The traditional lighting ceremony took place in Olympia, Greece on 10 May, 2012 and the Torch arrived in Britain nine days later. The UK leg of its journey began in Land’s End and it will blaze into Wales later today. If you can make it to Cardiff to cheer Matt on, we’ll hopefully see you on Saturday morning as we’ll be there, covering the whole event. The Flame will eventually reach the Olympic Stadium where it will light a cauldron symbolising the start of the Games. 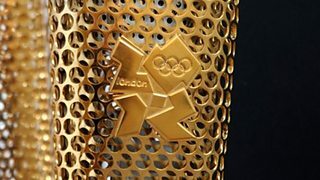 The BBC’s Olympic site has a wealth of material about the Torch, both in terms of history and its road to the 2012 Games. You can also visit the site to see Matt’s leg of the journey streamed live on Saturday morning. We hope to see you for this moment of history in the making.